00:30:00 Makes 8 servings, 1/2 cup each. This side dish makes a wonderful accompaniment for roast chicken or turkey. Preheat oven to 375°F. Place margarine in large saucepan. Add water. Bring to boil on medium-high heat. Stir in stuffing mix; cover. Remove from heat; let stand 5 min. 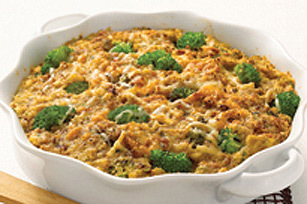 Add eggs, broccoli and 3/4 cup of the cheese; mix well. Spoon into greased 9-inch pie plate; sprinkle with remaining 1/4 cup cheese. Bake 20 min. or until top is lightly browned and cheese is melted. Serving Size Makes 8 servings, 1/2 cup each.